If your backyard is prone to flooding, it can be detrimental to the health and aesthetic of your plants, lawn, and even hardscapes. Homes of today are often built on sloped landscapes, leading to water runoff that builds up around the foundation of the house as well as any porches and patios. Wet weather is especially prevalent in the North Arlington, VA region, making it even more important to take precautions to protect your outdoor space. O’Grady’s Landscape specializes in designing and installing erosion control solutions to help combat this issue for North Arlington homes. To see what we can do for you, contact us online or call (703) 533-5001 for a FREE estimate. At O’Grady’s Landscape, we provide comprehensive lawn maintenance services to promote health and beauty in North Arlington, VA landscapes. Our erosion control solutions are integral to the success of that process, working to prevent damage to your property during North Arlington’s rainy springs and snowy winters. In smaller residential properties of North Arlington, VA, growing healthy, strong, and thick turf tends to be the most effective erosion control solution. 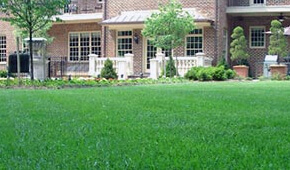 To ensure the success of the turf, our landscapers will begin by grading your property. They will then install a new drainage system designed to eliminate soil movement and properly direct water through the landscape and away from your home. While this is a popular method for erosion control in North Arlington, VA, many properties may require a combination of different solutions. Our landscapers will assess the scope of your landscape, taking into account any budget or style requirements you may have, to determine the best erosion control methods to meet your needs. For more information on grading and drainage, click here. The success of an erosion control solution relies on the craftsmanship, experience, and installation work of your landscape company. A minor erosion problem can quickly turn into a larger problem if left untreated or improperly dealt with. At O’Grady’s Landscape, we have years of experience and expertise installing erosion control systems in properties throughout North Arlington, VA and use only the highest quality products to get the job done right. You can trust any drainage issue in our hands! Don’t wait for your yard to flood to get it the protection it needs. Call O’Grady’s Landscape today at (703) 533-5001 for an erosion control solution that works in North Arlington, VA—we’ll get you an estimate within the week!